For example, you may come across a product that has a sleek, efficient interface, several enticing communications features and plenty of storage. You’ll start using the product, thinking it’s working great. But it will not provide any insight into the back-end network operations powering your system. You won’t see, for instance, where or how your data is being transmitted and stored. It won’t give you access to security updates. And the data you send over your network may even be sold to unauthorized third parties without your consent. Further, many Web collaboration services use an illicit practice called traffic pumping to offer free conferencing services. Traffic pumping involves partnering with local telecommunications companies to route traffic through them, thus bypassing—and driving up costs—for long-distance operators. Traffic pumping is a direct violation of the Telecommunications Act of 1996, but many companies engage in it and, unfortunately, it’s not always possible to spot. Onstream Media is one company that is actively working to change free online collaboration for businesses. 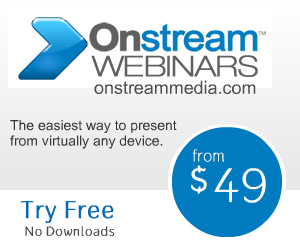 Onstream Media is an award-winning, industry-leading organization dedicated to providing premium conferencing and collaboration software. Only now is it offering a free version of its software that has come to be recognized by its customers as a game-changing service. Known as OnstreamMeetingsFree, the service provides end users with access to high-quality audio and video conferencing, as well as a full suite of embedded features that can be used to enhance presentations. Users also gain access to all of the support—and network visibility—they need to ensure that their data is safe and secure at all times. Curious about how OnstreamMeetingsFree differs from the rest of its freemium competitors? Click here to download the software, and try it for yourself.